In the Fall of 1999 I was asked by my make-up artist friend Arnold Gargiulo to appear as an actor in a benefit show for Cortlandt Hull's "Silver Screen Museum Fund." The job required me to endure 3 hours of make up application and one hour or so of removal. Well, I whole heartedly agreed because this was a "Planet Of The Apes" show and they wanted me to play a "special guest" ape. This, to me, was a dream come true! The show was on a Saturday afternoon at an abandoned High School in Bristol Connecticut. I was to drive out to Dobbs Ferry for a 7:00 am make up call, but I needed to take an assistant with me. Lucky for me my old friend Michael DeFilippo was available to help and the two of us set out for Arnold's make up studio and certainly a strange and wonderful day. Mike is a solid guy rooted in the old comic book genre, and a tremendous fan of classic horror and sci-fi. He was a regular at my old screenings in College Point, NY and has been a great friend for many years. He was the perfect person to have on hand. Mike drove us both out to Arnold's house in Westchester, where the crazy make up guys were waiting for me. It would be here that I would be transformed from human to simian in a little over 2 hours. Mike was responsible for taking photos of the process which accompanies this story. I first met Arnold at the New Jersey Meadowlands Hilton for a Chiller Monster Convention in the mid 90s. Over the years, we became fast friends and fellow movie prop collectors. Arnold has contributed much to my monster museum and this would be the second time I sat for his make-up artistry. Arnold has worked on many feature films including "Black Rain" with Michael Douglas, "The Alien's Deadly Spawn" and "Frankenhooker." He works as a make up artist these days at the Metropolitan Opera in New York City. I love these guys. What could go wrong today? As I settled into the make up chair, latex appliances were glued onto my face one step at a time. I usually had to remain perfectly still throughout most of this, although Mike did take some very funny photos of the whole thing, some of which appear in this article. The application of a perfect fitting wig was all it took to end the session, so when I finally looked upon myself in a mirror I was amazed. I had transformed into one of the citizens of an ape society, which had dominated the human race for ages. I wiggled my nose, puffed out my cheeks, ruffled my brow... I was indeed an ape... who was suddenly late for a stage show. So Mike and I climbed back into his car and sped off to the show. Motorists along the way were apparently not happy to see me smiling at them at every red light. Mike had pulled alongside a guy on a motorcycle who looked like he wanted to bash my ape nose in. "Why?" I thought. Was I experiencing some sort of ape racism? We arrived at the show and started to set up. The host of the evening was Cortlandt Hull who is one of the most fantastic collectors of monster movie material of all. Since the 1960s he has been the chief operator of "The Witches Dungeon" monster museum, a wonderful tourist attraction in Bristol. He conceived this night as a way of making money for an even bigger museum that he plans to build soon. I used to read about Cortlandt in the pages of "Famous Monsters of Filmland" magazine when I was a kid. This guy was cool! Make up artist Arnold Gargiulo on right. It was about noon when we all broke for lunch. Arnold, Mike and a few other guys decided that we would drive over to "Subway" to get sandwiches. I, on the other hand, would have to order something like french fries. Anything bigger just would not fit through my ape mouth, and I also would have to drink through a straw. In order for me to eat I had to push the food past my fake mouth and down to my real human mouth. It was quite a delicate situation. I mean, I didn't want to choke to death... and as an ape! So we all drove over together and parked directly in front of the store. I was getting out of the car and walking through the door of the sandwich place, when the owner immediately said to us "No sandwich for him" meaning me... "He can't come in here with that mask!" Arnold had tried to explain to this guy that it wasn't a mask that I could remove and that we were doing a show at the school. Again, the sandwich guy said "No sandwich for him!!!" Arnold told me that he'd take care of the situation and to wait in the car, which I did. These sandwich making guys probably thought that we were up to no good, or were going to rob them or something - so I waited alone in the car for these guys to come back with my fries and drink - and I waited, and waited, and waited some more. Why didn't those guys come back for me? I tried not to move around too much or look out the window because of course it would tend to attract the attention of people walking by. They'd stare at me like I was an animal at the Bronx Zoo. Twenty minutes went by and I happened to notice that my friends had sat down to a lovely lunch and apparently had forgotten all about me. I had no food, no drink, and it was about 70 degrees in the car - but with the make up on it seemed more like 80. I made one attempt to get my friends and something to gnaw on, but as soon as I opened that damn door I could hear the manager yelling "No no no no!! No sandwich! No sandwich!" So I just sat back in the car thirsty and starving, waiting for my handlers - who now seemed to be getting their dessert! I was fuming. The photo you see here is a self portrait I took as I was abandoned and waiting for everyone to return. Finally, Mike I think, showed up with a small package of fries, which I swear I made happy ape sounds when I saw them! 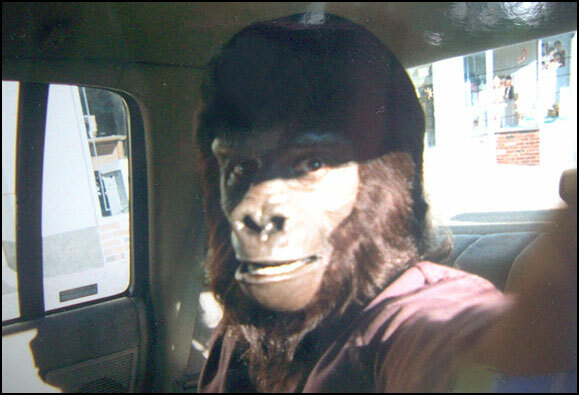 On the drive back I began to wonder again if I was the victim of some sort of anti-ape discrimination. It was a strange thing that had happened. Well, we did the show, made a lot of children smile, and I signed a lot of autographs which kind of made up for the sandwich incident. I had seen the world of humans through the eyes of something not human and I really learned a lot from my day as an ape. I will never forget it. Mike and I, during the last phase of make up application.